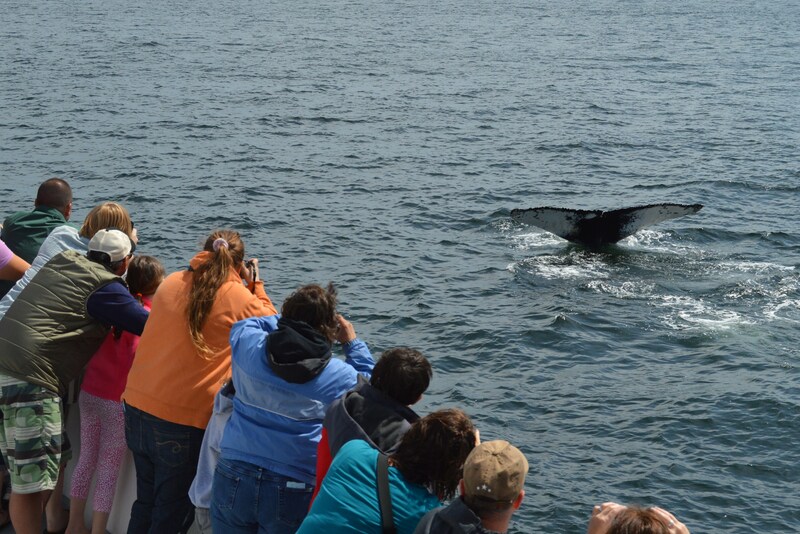 We had a really exciting day today, with most of it being spent watching a humpback named Pinball. She is a female that we have been seeing since early May, and today we noticed how she looks a little bit bigger than a few weeks ago, evidence that she has been doing some feeding over the past few weeks. We had fantastic looks to start, and then began seeing bubble clouds, evidence that she was feeding. Just one of the great looks at Pinball! If you look on either side of the fluke, you can see why this whale gets the name Pinball. We were also lucky enough to see a tail breach from her. 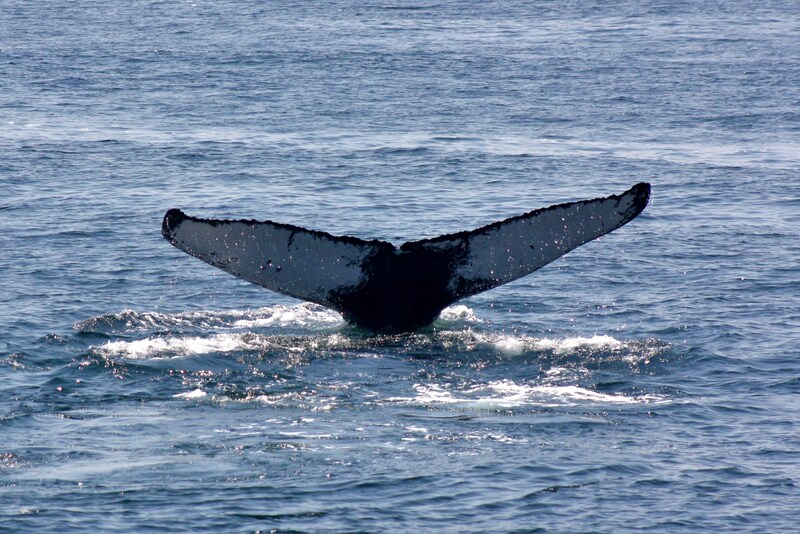 A tail breach is when the whale throws its tail, or fluke, out of the water very suddenly. Hopefully everyone got to see it! 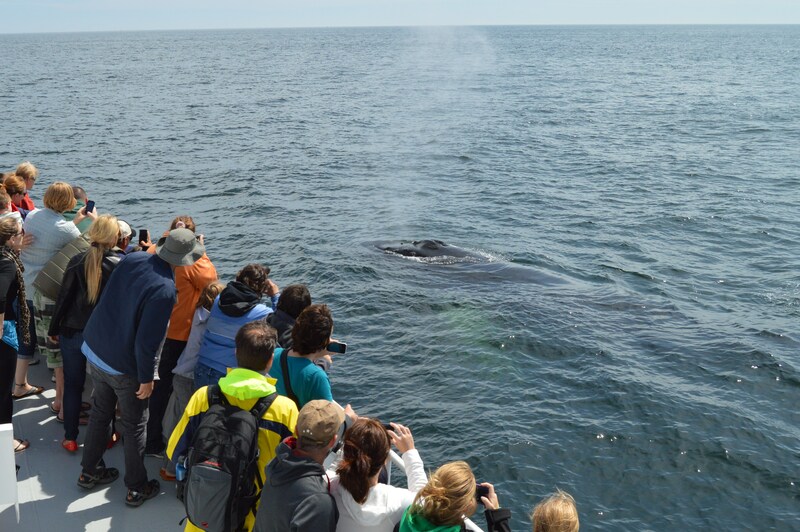 It was also a great day in the sense that we had a lot of great conversations with passengers, both on the way out to see the whales as well as on the ride back in. We are always excited to share our knowledge and talk with all of the people we get to meet. 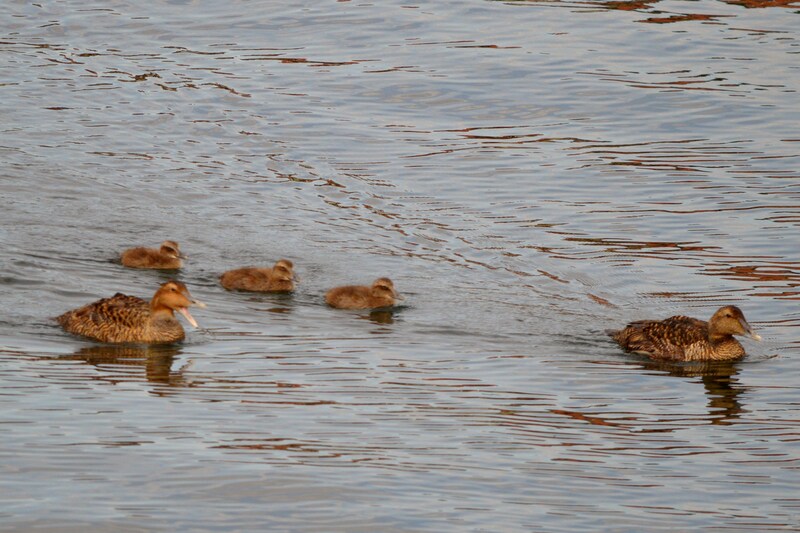 We also got to see these eider ducklings that have been hanging around the inner harbor lately. Today was such a great day! With the weather heating up, we can’t wait to get out on the water. The past few days have brought smooth seas and comfortable temperatures, perfect conditions for being out on the ocean. There were a number of whales in the area- we watched three humpbacks, a fin whale, two minkes, and there were also other whales in the area. 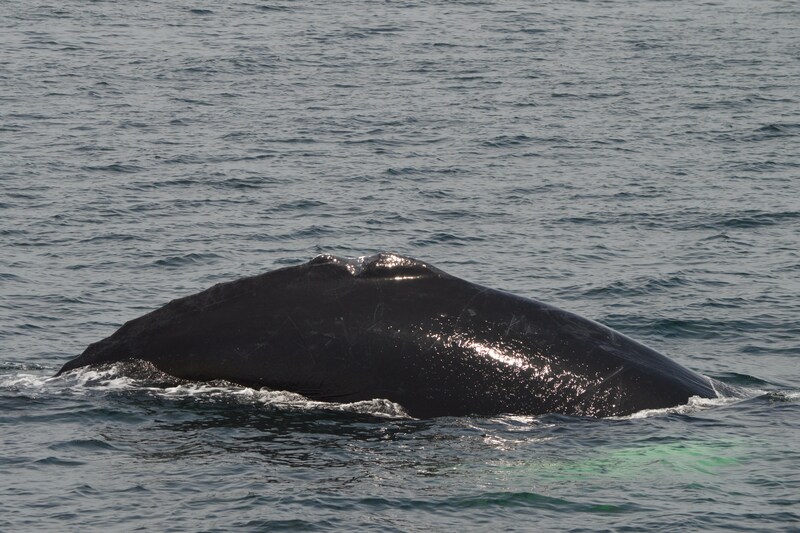 The first humpback was a whale named Boomerang, a female (her last calf was born in 2012). She was taking short dives and changing directions very quickly. We determined that she was feeding, and our fish finder showed huge patches of bait fish. You can see the black mark at the top of the fluke where Boomerang gets her name! 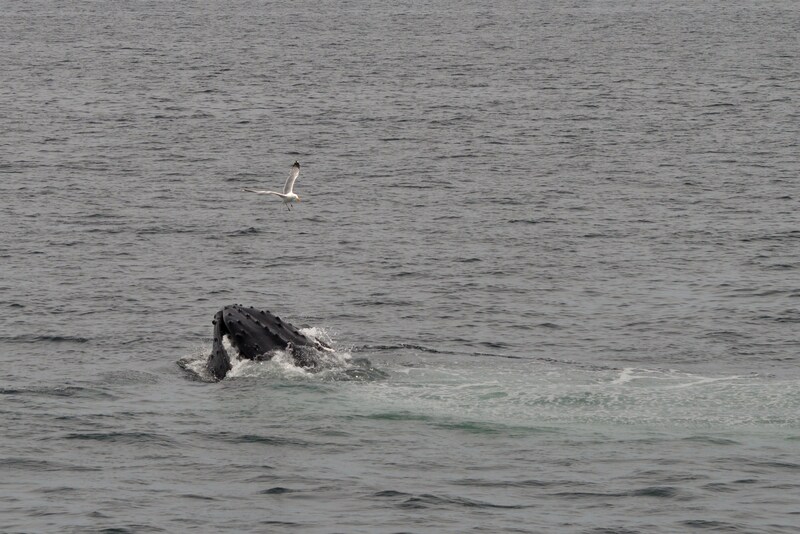 Two other humpbacks, one being Pinball and the other a whale whose fluke we did not get to see were also feeding. Pinball was blowing large bubble clouds, one of which spanned a good sized section of our port side! 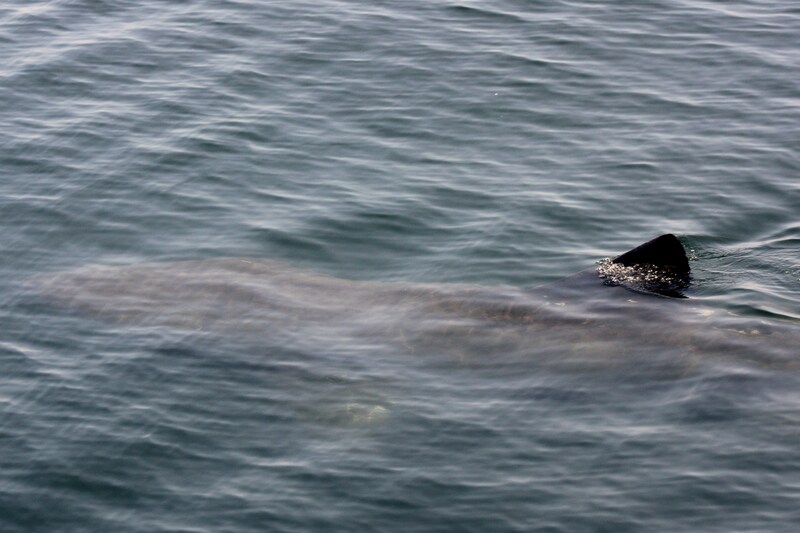 The highlight of the trip for me was the basking shark at the very end. Since sharks are fish, they do not need to come to the surface to breathe, so we don’t see them often. We had such great looks at this one! 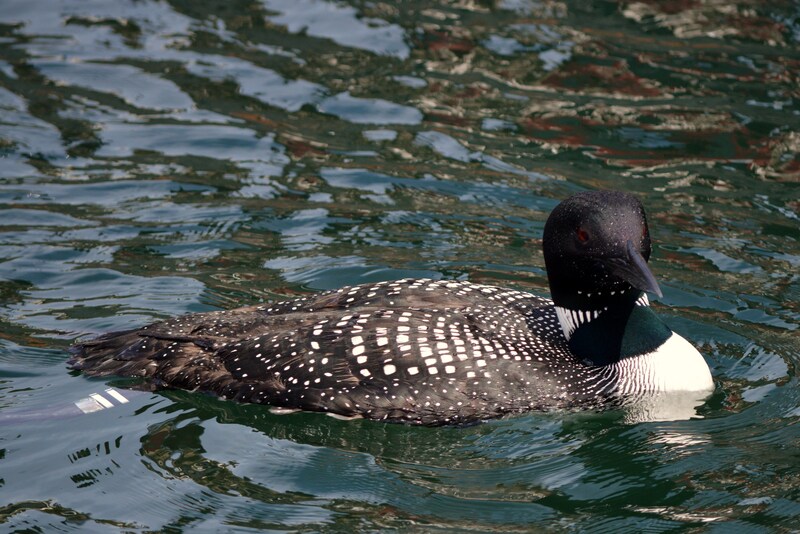 It swam very close to the boat, and didn’t move fast, so we spent a good amount of time watching it. Captain John estimates it was about 30 feet long. Definitely the best look at a basking shark I’ve ever had!! 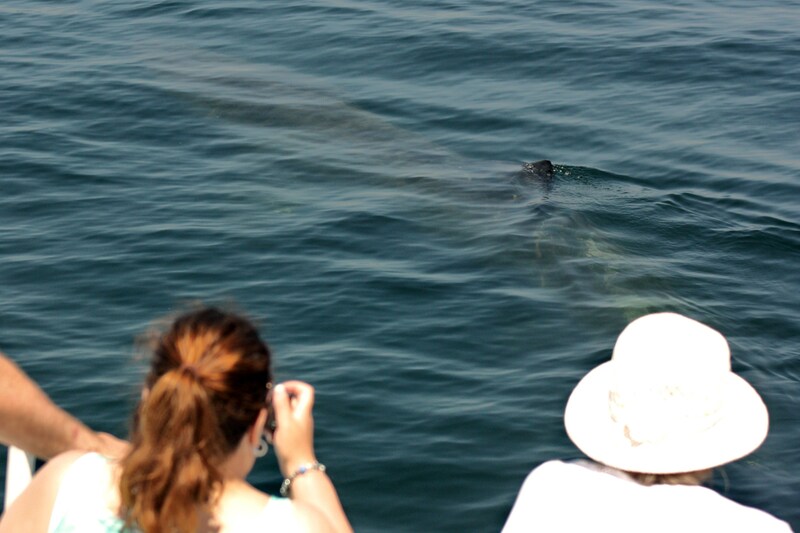 A little bit hard to see, but this basking shark was huge! And so close! 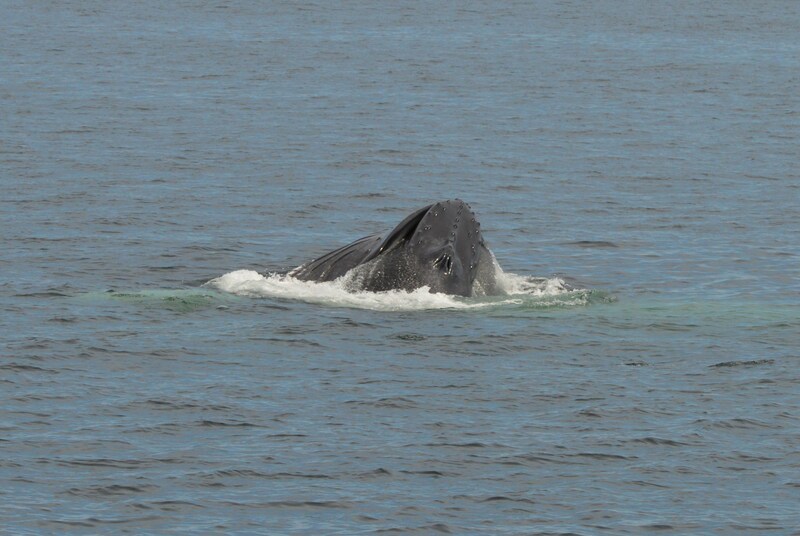 And another- you can notice the typical rounded dorsal fin.